Can a CT Scan be Avoided after a Child’s Abdominal Injury? Home » Can a CT Scan be Avoided after a Child’s Abdominal Injury? 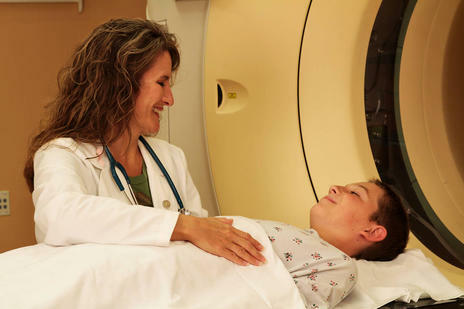 In a large new study researchers have determined the seven major factors that can help doctors know whether a child with an abdomen injury needs a CT scan or not. A computed tomography (CT) scan though essential after a traumatic injury, may pose radiation hazards to children risking future cancer. The new research therefore can help in deciding if the scans can be bypassed. The study of more than 12,000 children from emergency departments throughout the country in the Pediatric Emergency Care Applied Research Network (PECARN) is published online before the printed upcoming issue of Annals of Emergency Medicine. The study looked at children who had suffered a blunt trauma on their abdomen or torso area specifically due to a car/ bicycle crash, fall or an assault. A variety of factors related to the children’s histories and clinical presentations were evaluated. Among these, seven were identified as clinically important injuries and factors that could determine whether a CT scan was needed or not. The factors include evidence of trauma on the abdomen or chest (such as seat-belt marks), neurological changes, abdominal pain or tenderness, abnormal breath sounds and vomiting. If children coming to the trauma centee did not show any of these seven factors after their injury, the CT scan according to the researchers was not needed as it could rarely provide any additional information. The researchers stress that the risk of developing a future cancer from radiation exposure from a CT scan in this situation outweighs the risk of having a significant medical problem from the abdominal injury. The authors also adds as a caution that the factors have been devised to rule out the use of CT scan. If one of the factors is being observed in a child though, it does not necessarily mean that a CT scan becomes mandatory. Holmes says that clinical judgment plays an important role in determining whether a CT is needed in each case as it should always be used as a last resort. There are other alternative methods of observation present like extending the period of observation in the emergency department, using findings from laboratory tests and ultrasonography. He notes that further study is needed before the seven factor prediction rule can be generally applied for all children who have had an abdominal injury. Another study at the UC Davis Medical Center is also checking if the use of ultrasonography in these cases may further reduce the use of CT scan. PECARN is a network of pediatric emergency departments throughout the United States that enables researchers to gather enough data to perform significant studies on critical issues in pediatric emergency medicine. The network has helped in many new standards including that for head trauma, diabetes and infections in children.